I wear these every single day--and take them out every afternoon to swim with Daisy (4:30, be there or be square). These were my grandmother's pearls. A month ago I lost one, and coming through the living room I said to Clara, who was sitting on the couch, "I've lost an earring--let me know if you see it." "Isn't that it?" she asked, pointing to the floor by our feet. Drama over. Two things. One, it is nice to know I am not the only 'oddball' woman out there with one pair of earrings. Mine are also pearls. Two, my mom yelled for me one day....many, many moons ago, and asked that I help her find her glasses. While trying hard not to laugh I asked, "you mean the ones on top of your head?" Drama over indeed. Thanks for the laugh and memories. I do hope you and The Composer had a wonderful anniversary. I'm assuming you were in a tizzy, and Clara wasn't, and that's why she saw it. Glad it's found! I have a thing for earrings, and love to have several pairs. But in my ongoing journey toward more minimalism, I only want the earrings I'm regularly wearing. Loved this! I have a recent earring story. I also have a pair that I wear most of the time. They are black pearls, the gift my daughter gave both mothers at her wedding. We were visiting our daughter near Boston when I laid my earrings down on a table to protect them while changing clothes. Later when I went to put them on, they were no longer there. My husband said her very large dog had been sniffing in that area. I assumed Charlie had eaten the earrings. I was upset at myself, not the dog. I wear pearls each day too! They were a gift from my grandmother--did not actually belong to her. My husband once lost his wedding ring in the garden. It was there for a whole year. (He'd been burning brush--we used a metal detector over the whole yard...) Then one day the next summer he was weeding a row of tomatoes and found it glistening in the sun....! We were happy! With most things I'm quite restrained but with earrings I have far too many and they drive me nuts as I go through the morning untangle. Inspired by you Anna, I shall reduce them to five pairs and send the rest to Lifeline. Thank you. Polly, that's an amazing story. My father lost his wedding ring in a sack of corn seed and found it the next year. Twice I've lost the stone from my engagement ring and found it again miraculously, after several weeks--it's been secured by much better prongs since. i wear pearls most every day (as my blog name says...). and i'm still looking. hoping. SO GLAD you found your pearls. I'm so glad you found it. so charming. 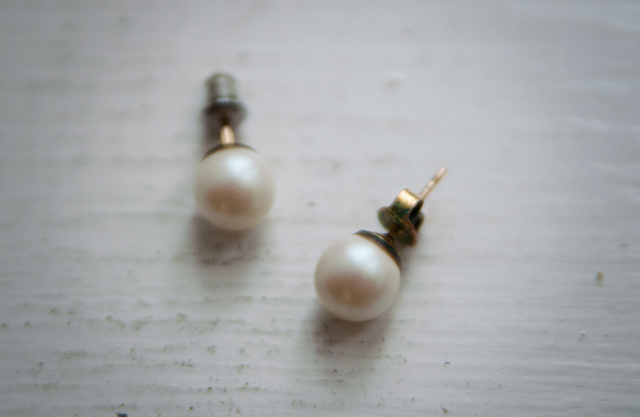 I helped to plan and host a "pearl party" one time (I blogged it) because my friends and I think that all pearls have stories :) My name means "pearl" which I love. My grandmother told me that her mother had pierced ears with little ruby earrings - and they were her only earrings. My great-grandmother Ada passed away in 1931 and I suppose the earrings were buried with her. I have a big collection of various earrings, but I usually wear simple silver hoops about the size of a quarter - most every day. Pearls are simple and always nice.